Starting a dog exercise regimen today will help keep your Miniature Schnauzer in tip-top shape from head to tail! And preventing dog obesity is whole lot easier than correcting it! It’s true! Our dogs are getting fat! And that’s not good. Did you know that an overweight dog is more likely to suffer from arthritis, heart disease, cancer, diabetes, pancreatitis and the list goes on..... not to mention it contributes to an earlier death for dogs. So, it’s time to cut the fat and get healthy! It’s a simple matter of reducing calories and increasing activity. But of course, we all know that’s a lot easier said than done. So first things first: How to Tell if Your Dog is Fat; Next: Choose from a list of exercises for dogs to get your Mini Schnauzer moving; and lastly read through our list of doggy weight loss and exercise tips. How do you tell if your Schnauzer is fat? Here are some ways to determine if your Miniature Schnauzer needs to drop a few pounds. Take an overhead view of your Miniature Schnauzer. There should be no bulging at your Miniature Schnauzer's waist line. Next, run your hands over your Miniature Schnauzer’s ribs. Can you feel them? If your Miniature Schnauzer’s ribs are difficult to feel, a diet is probably in order for your dog. Also, don’t forget to perform your weekly Miniature Schnauzer dog checkup. Keeping a watchful eye on your Miniature Schnauzer's overall health, including any weight changes, is the best way to prevent your Miniature Schnauzer dog from ever getting fat! Walk A daily walk is the perfect dog exercise for your Miniature Schnauzer. 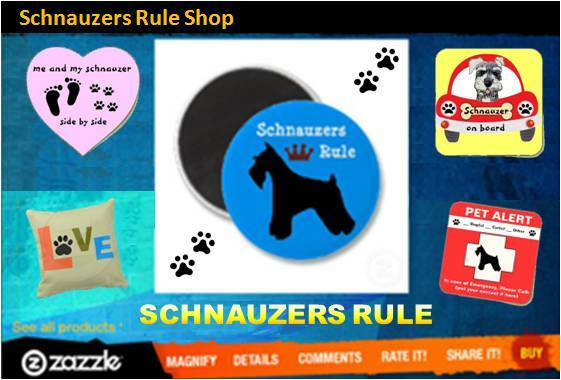 Whether it’s a brisk walk around your neighborhood or at a nearby dog park, your Miniature Schnauzer will love it. Get at least 2 good walks in per day with your Miniature Schnauzer. 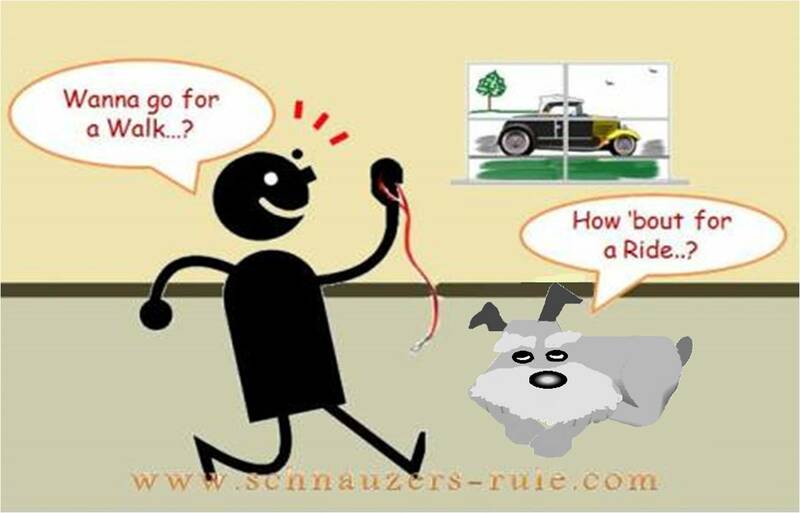 If you can’t walk your Miniature Schnauzer that often, think about enlisting the help of a dog walking service. Dog Parks - Besides having great trails and off leash runs, dog parks offer the opportunity for your Miniature Schnauzer to socialize with other dogs and people. It's a fun way to add some dog exercise in your Miniature Schnauzer's routine. Treadmill - Some people have taught their dogs to walk on treadmills. Yep! They even sell dog treadmills. If you can teach your Miniature Schnauzer how to do this, great! Just make sure the treadmill is set on a very slow speed. Don’t overdo it. And I can’t stress this enough - SUPERVISE! And never ever strap or leash your Miniature Schnauzer dog to the treadmill! That's a no-no and an accident waiting to happen. Agility - Another great dog exercise for your Miniature Schnauzer is agility. You can get started with an agility set for your backyard. Not only is dog agility training good physical exercise, it challenges dogs mentally too as they must remain focused on the dog-handler as well as navigating the course. Dog agility is quickly becoming one of the best dog sports of today. There are plenty of affordable agility sets and dog agility training videos & books; and/or you can enroll your Miniature Schnauzer in a dog agility training class. I bet you'll find out that your Miniature Schnauzer really likes agility, and in fact, is actually quite good at agility! Check out Miniature Schnauzer Reece's agility run. Swimming - Another great low impact dog exercise is swimming. Just be sure to always closely supervise your dog swimming. Your Schnauzer could easily tire and then have difficulty exiting the pool. He could panic and drown. 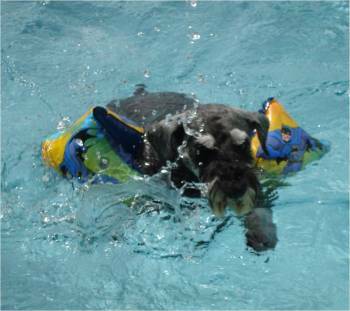 In fact, it's a good idea to have your Miniature Schnauzer wear a dog life vest while in the pool or swimming anywhere. Snow Play - There's no reason for your Miniature Schnauzer to gain weight during the winter months, either (like most of us humans do). The breed loves the cold weather and good romp around the snow will tire your Miniature Schnauzer out and help build his leg muscles! Play Activities & Tricks - Play exercise and dog trick training games, like hide-n-seek, offer both mental and physical exercise for your Miniature Schnauzer. Since Miniature Schnauzers were originally bred to hunt down vermin, hang up a few squirrel and bird feeders in your backyard and then watch the fun. Your Miniature Schnauzer will get lots of exercise chasing away those pesky vermins. With so many fun activities, there's no reason to have a fat Miniature Schnauzer. Always ask your Miniature Schnauzer's Veterinarian before beginning any fitness program with your Miniature Schnauzer dog. Your Miniature Schnauzer's vet is the best person to consult, as each individual dog will have specific needs based on their current age, weight, and overall physical health. Dog Exercise = Big Benefits - Exercising your Miniature Schnauzer provides an outlet for your dog to release energy. Dogs who lack in exercise usually compensate in more destructive behavior or overeating out of boredom. Always take along plenty of fresh water on your outings for your Miniature Schnauzer. This is easy to do with dog travel bowls and drink dispensers. Don't overdo it. Your dog’s exercise routine should be fun for both you and your Miniature Schnauzer. The key is for your Miniature Schnauzer to get and remain fit, have fun, and be healthy. Cut back on the treats. Don't forget to reduce your Miniature Schnauzer's caloric intake. An easy way to do this without your Miniature Schnauzer dog feeling deprived, is to substitute regular 'store bought treats' with fresh vegetables, like green beans! dog exercise tip: Finish off the week with a nice relaxing dog massage! Further Reading: How a dog exercise pen can provide your new puppy with a safe enclosure to romp around and it helps with house training too. And at the end of the day, you'll have a tired but very happy Miniature Schnauzer. KNOWLEDGE SHARE ... If you found this information on Exercise for Dogs helpful please share it with your dog-loving friends by clicking on one of the share links at the top right or bottom of this page. It could save a dog's life! 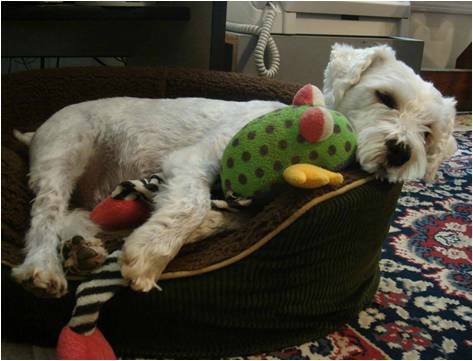 Share your Schnauzer's favorite activity. ★ Are You Ready to Own a Dog?